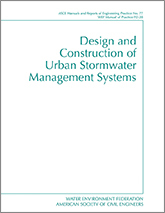 Design and Construction of Urban Stormwater Management Systems presents a comprehensive examination of the issues involved in engineering urban stormwater systems. This Manual—which updates relevant portions of Design and Construction of Sanitary and Storm Sewers, MOP 37—reflects the many changes taking place in the field, such as the use of microcomputers and the need to control the quality of runoff as well as the quantity. Chapters are prepared by authors with experience and expertise in the particular subject area. The Manual aids the practicing engineer by presenting a brief summary of currently accepted procedures relating to the following areas: financial services; regulations; surveys and investigations; design concepts and master planning; hydrology and water quality; storm drainage hydraulics; and computer modeling. GMT+8, 2019-4-19 15:04 , Processed in 0.151062 second(s), 29 queries .